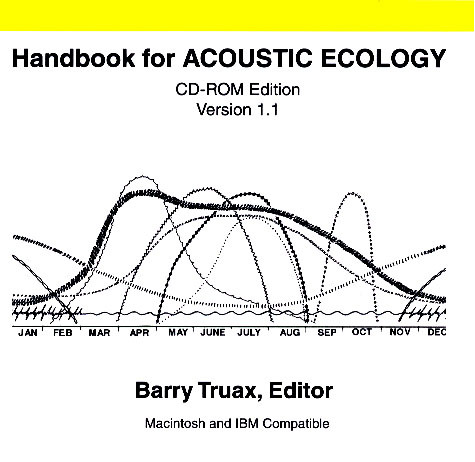 Cambridge Street Publishing is pleased to announce the publication of a revised and updated CD-ROM version of the original Handbook for Acoustic Ecology, edited by Barry Truax, Professor in the School of Communication and (formerly) the School for Contemporary Arts at Simon Fraser University. As with the original 1978 edition, this new version brings together over 500 terms from the fields of acoustics, psychoacoustics, environmental acoustics and noise measurement, electroacoustics, music, linguistics, audiology, and soundscape studies, with extensive cross-references (now active links!) and straightforward explanations suitable for the undergraduate or layperson interested in acoustic communication. Numerous diagrams, charts and tables provide additional reference information. Included for the first time in this edition are 150 sound examples, many of which are drawn from the rich collection of environmental sounds of the World Soundscape Project. New to this edition is a thematic search engine that supplements the conventional alphabetical one. Related terms across various disciplines are brought together under the themes of Vibration and Magnitude, Sound-Medium Interface, Sound-Environment Interaction, Sound-Sound Interaction, as well as the specific themes of Audiology and Hearing Loss, Noise Measurement Systems, Electroacoustic and Tape Studio, Linguistics and Speech Acoustics, and Communications Theory. The CD-ROM runs on either the Mac or the PC using any browser. The preferred browser (Explorer 5.2) which runs on both systems (and plays soundfiles in a small window overtop the page) is included on the CD-ROM. The CD-ROM is included in the 2nd edition of Acoustic Communication, published by Greenwood Press. Note, these files may be interfaced to the HTML Documentation DVD's (those for granular synthesis and soundscape composition, as well as text-based composition). ... the Handbook for Acoustic Ecology is an invaluable resource for educators, sound designers, composers, students of electroacoustic music, and anyone baffled by the lingo of sound, acoustics, and sound ecology. - Laurie Radford, Computer Music Journal. Swedish, Romanian and Estonian versions of this page are also available.